My friends and I recently hosted a wine and cheese tasting party. The idea was that we would provide some wine and cheeses, and each of our guests would bring their favorite bottle, or a bottle they have been wanting to try. We ended up with a wide variety from sweet whites to dry reds, with a little bit of everything in between. Yes, someone even brought Franzia (#socollege). In our small row home in Manayunk, it was tough to find a place to set everything up, so we designated our dining room table for the cheeses and snacks, and decided to convert our baker's rack into a wine bar! We designated one shelf for all 15 wine glasses for our guests, in addition to small Dixie cups that were intended for people to use when tasting a new wine that they may never have tried before. On the next shelf, we had small plates, napkins & toothpicks for people to grab. We decorated with little accents of fresh flowers and a small chalkboard easel that we wrote "Grab a glass!" to encourage our guests to start here! For our table spread, we laid out a piece of brown paper across our dining room table. We arranged an assortment of cheeses (labeling each with sharpie written on the paper), in addition to the usual cocktail party fare, i.e. veggies and hummus, nuts, crackers, olives. 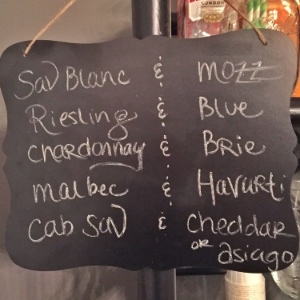 We also researched what cheese paired well with specific types of wines and displayed them on a chalkboard as shown below. This guided our tasters to combining the best flavors, and encouraged less adventurous guests to try new pairings. The party was a huge success and all of our friends left with a new favorite (or not-so-favorite) cheese and wine. I'd say the top wine was the Dark Horse Red Blend, the least favorite, but most adventurous, was the Chocolate Lab - a chocolate flavored wine. And for all those blue cheese haters - before making judgment, you must try blue cheese on a slice of granny smith apple and wash it down with a sip of Riesling.... you might change your mind on blue cheese after that! Now, I hope I've inspired you to throw your next wine and cheese tasting party. People loved not only getting together to mingle with friends, but also the opportunity to try new things and have fun while doing it!